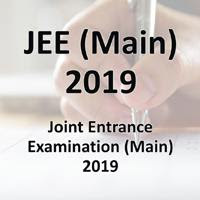 Joint Entrance Examination (JEE) MAIN will be conducted by the NTA (National Testing Agency) from 2019 onwards. This Examination was being Conducted by the Central Board of Secondary Education (CBSE) till 2018. JEE Main is Applicable for Admission to NITs, IIITs and CFTIs participating though Central Seat Allocation Board subject to the condition that the Candidate should have secured at least 75% Marks in the 12th class Examination, or be in the top 20 Percentile in the 12th Class Examination conducted by the respective Boards. For SC / ST Candidates the Qualifying marks would be 65% in the 12th Class Examination. The First JEE (Main) Exam was Conducted by NTA Between 8th January, 2019 and 12th January, 2019 in two Shifts Per Day across 258 Cities in the Country and Abroad. A Total Number of 929198 Candidates were Registered for Paper-1 (B.E. / B.Tech.) in this Examination. There were 467 Examination Centres across the Country and Abroad. The Paper-1 was Conducted in a Total of 8 shifts from 9th to 12th January 2019.